This little restaurant above the Central Fish Market is an agreeable spot in the heart of Bantry – and the location is no coincidence, as Colman Keohane and Anne Marie Murphy, owners of the fish shop and restaurant respectively, are brother and sister. Much of the simply cooked fish and seafood comes from Bantry Bay, and the real story at The Fish Kitchen is told on the blackboard, where the specials of the day are listed. Seats 28. Open Tue-Sat (& Mon Jul/Aug), 12pm-9pm, L 12pm-3pm & D 5.30-9pm. Closed Sun (except Bank Hols), Mon (except Jul & Aug). Open all year. MasterCard, Visa. This little restaurant above the Central Fish Market is an agreeable choice on the dining scene in the heart of Bantry – and the location is no coincidence, as Colman Keohane and Anne Marie Murphy, owners of the fish shop and restaurant respectively, are brother and sister. Once up the narrow staircase, you enter a large, light room with simple décor of the piscatorial kind, furnished with plain wooden tables and chairs, where the fresh flowers on each table are welcome. With the exception of sirloin steak, the chorizo in their 'chorizo chilli prawns' starter and a vegetarian option, the menu is entirely fish; it comes from the fish shop downstairs of course and, although there are occasional imports eg the ubiquitous tiger prawn, it is mainly sourced from the co-ops and trawlers of the ports in South-West Ireland. 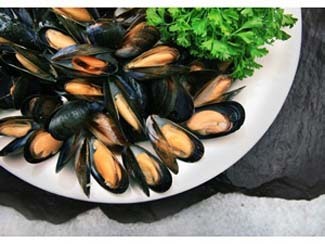 Bantry is renowned for its mussels, which come from nearby Roaring Water Bay or Bantry Bay itself - which is also the source of the scallops and lobsters, while crabmeat comes from Dingle. Whitefish such as hake, john dory and monkfish are landed in Union Hall, Castletownbere and Dingle, and oysters are from various locations around Ireland. Together with sustainability and traceability, the aims here are freshness, simplicity and quality - and there's innovation too, as seen in an interest in using seaweed: laminaria (kelp) finds its way onto the menu in bread, stocks and wraps. Lunch consists of dishes such as breaded mussels and seafood chowder, with variations on fish and chips and mushy peas a perennial favourite - and traditional fish pie and grilled lemon sole topped with lemon butter are possible specials. 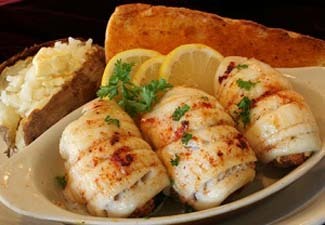 Thanks to the close connection with the fish shop, you could even ask for a variety that isn't on the board and it may be possible to cook it specially. In the evening the dining is a little more complex (with seafood platter and High Tide - Green Grass – a change from surf’n’turf – among the offerings; the latter is a sirloin steak topped with scallops, in season, or prawns), but the real story at The Fish Kitchen is told on the blackboard, where the specials of the day are listed. 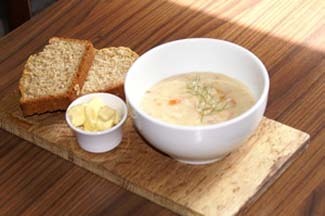 Fish comes in fresh several times a week from Castletownbere and Union Hall, so the dishes follow the catch. 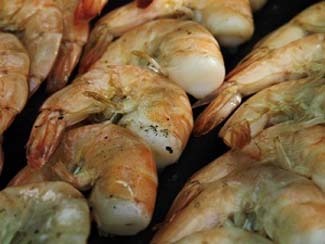 Expect to find lobster in season and other shellfish (crevettes, say), plus the likes of skate wing with black butter and capers, or grilled mackerel on a bed of Caesar salad. Other evening specials could include steamed clams with provencale sauce, calamari with lemon mayo and grilled brill with beurre blanc. 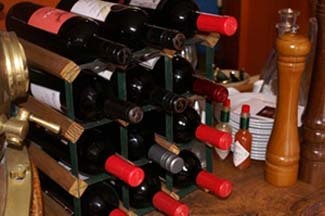 The wine list is reasonably priced, although it would be useful to be able to order half bottles; however, a limited choice of wine by the glass is offered (two white and one red). 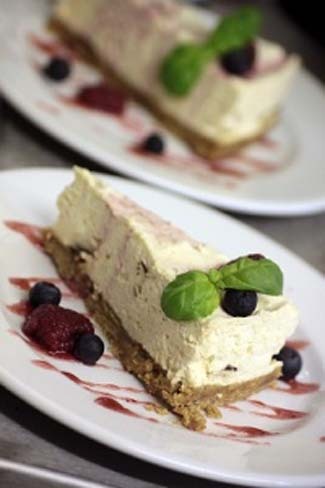 Puddings are all made in house and might include Eton Mess or tarts made from local seasonal fruit, and the coffee is above average, while prices are definitely affordable.